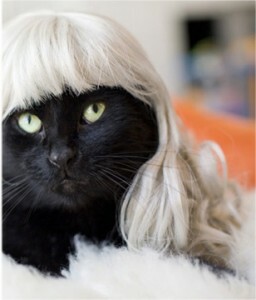 Kitty Wigs: The Sequel – the feline madness continues. Following on from my previous Kitty Wigs post, I came across some more amusing and disturbing information regarding the Kitty Wigs website that I discovered recently. Here is an actual photo from the www.kittywigs.com website with the word for word description below that comes with one of the four wigs available for sale (at $60!). The feline madness speaks for itself!!! ‘Silver is all about sophistication. Indoors or out, this wig takes Shaft to a special place — where everything is sleek and svelte, young and foxy. Check out this rather niche website, www.kittywigs.com , where you can order a colourful wig for your lucky kitty !! I personally don’t find the look aesthetically pleasing and would in fact suggest that it looks positively demonic. From a practical perspective and from my own personal experience, we have a cat, Tony, who if he does not wish to be stroked, it’s just not going to happen.The thought of even trying to make Tony more handsome with a pink wig is highly unlikely if he’s not on board with the idea ! In addition, I imagine when the ends of your beloved cat’s’ beautiful locks are covered in either chicken in jelly or sour milk, the desired look that the cat’s owner was aspiring to must surely be lost !! 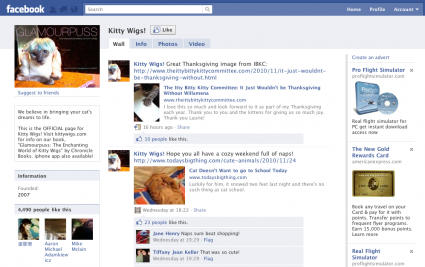 Here’s where it gets even weirder, I then discovered that Facebook has 8 separate fan pages for these Cat wig enthusiasts, the most popular of which has nearly 5 000 fans, www.facebook.com/pages/Kitty-Wigs !! If you look at the image above of the cat in the pink wig, I don’t believe that he thinks he is living the dream, but is probably more likely to be thinking that he is going to leave a surprise in his owner ‘s slippers in the morning ! !